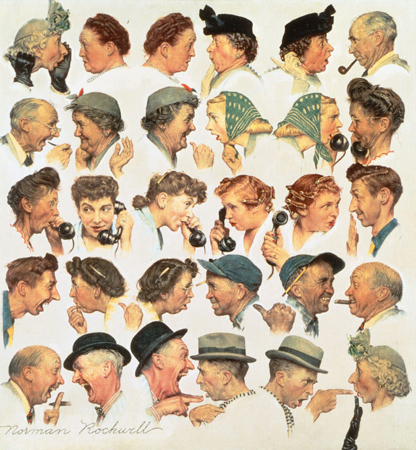 What I admired about Norman Rockwell was that he really never attacked the status quo of “sensible” behavior. Rather he simply showed that status quo in such a way that a feeling was prompted that was not sensible: Pragmatism crumbled, and one laughed and felt affection for neighbors, despite their bad behavior. Nothing in my recent life was making me feel that way, initially. Now I can laugh, but it took me a while to get the joke. And, during the time it takes me to get the joke, I find it is usually wisest to be quiet. (Not always, but usually). The joke this time involved the simple fact I’m not as strong as I used to be, and need to downsize the vegetable garden. However last April people got enthusiastic, and there was a lot of talk about assistance. So, rather than putting in a smaller garden, I put in a big one. Then, when it came time for the assistance to manifest, guess what happened? The failure of assistance to materialize doesn’t occur all at once, like Lucy snatching away the football. Rather it happens by slow stages and degrees, for the road to a weedy garden is paved with good intentions. As it happens I work harder and harder, trying to make up for the failure of man-hours to manifest, but eventually I have to face the fact I just can’t do it alone. This year I couldn’t even keep up with the watering, during the early-spring drought, and couldn’t keep up with the planting schedule. And when the rains came and the weeds exploded, as they always do, I sadly gazed out over a garden that had gone the wrong sort of green. I think in April people go mad. That’s why we have April Fool’s Day, so you can get it out of your system, but people never do. Instead it manifests as mad ambition, and in terms of a vegetable garden, people become enchanted by a picture Norman Rockwell never painted, (that I know of). It is a picture of people all working happily together under the hot summer sun, in a tidy garden without a weed, and baskets of bounty being canned and frozen by smiling folk who just love the job. It is what the old timers called a “bee”, but what people forget is that a bee took a job that basically sucked, and made it be fun. Few women really liked to sew, and if they had to do it alone they likely would be cursing quietly beneath their breath, but when it became a “sewing bee” it was far more fun. In like manner picking the meat from crabs was a tedious job that sucked, but I saw women up in Maine turn it into a crab-picking-bee, and it truly was a time of laughter and a joyous social event. However the thing of it was that these jobs were jobs that had to be done. Nowadays no one really needs to sew, so why bother? In the old days the farm garden kept you from starving, so you had better darn well make sure it was weeded. Now it is just a sort of appendage to your yard, and perhaps a way to get fresher food, but definitely not a matter of life and death. I personally enjoy the exercise, because it does produce something that is far better than the stuff you get at a supermarket, and anyway, going to a gym always seemed a waste of time and money to me. A garden produces food, but a gym only produces vanity, and a salve for the fear of getting fat, unattractive and dying of a heart attack. A gym is all about the ego, but a garden is about other things, and you can forget yourself there. Now I am contemplating the fact that people may have a dream of working in the hot sun like a happy, healthy peasant, but when push comes to shove, no one (except, apparently, me), actually wants to be a peasant. 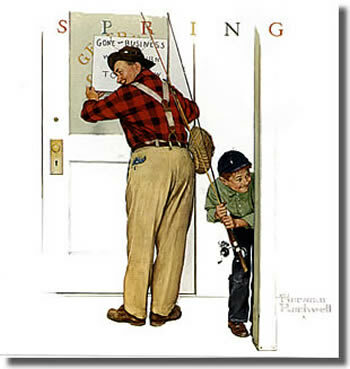 In fact when I think of Norman Rockwell’s paintings they seem to be more about playing hooky. What I really need is a patron who will donate a vast sum so I can hire a weeder. Fat chance of that happening around here. People around here won’t even donate much for widows and orphans, (let alone for poets who seem to goof off for a living), and yet these same impoverished people seem to have all sorts of extra money to have go up in smoke, when July fourth rolls around. I suppose I should be understanding. When young I used to go through considerable risk to buy illegal fireworks in a back alley of Boston’s tiny Chinatown, but my views have changed since then. Physical fireworks are lame, compared to poetry. Heck, even LSD now seems like a slum, compared to really being high. However others, who have not a nickle to spare for charity, will pay two hundred for beer and a thousand for fireworks. However I have little patience with people who haven’t grown up while I have. When I was young the daylight on July fourth never seemed to end, as I agonized waiting for fireworks. Now, after fishing with seven boys, and feeding goats, pigs, chickens and a rabbit, and even doing a small amount of desultory weeding, all I want on the evening of July 4 is a shower and my pillow. However before I turned in I did warn my middle son, who is younger and more energetic and had four college buddies dropping by, that he should not set off fireworks anywhere near our goats, because our goats are not patriotic. Just as my head was nestling down into my pillow the cellphone call came from somewhere in the woods, from my son. The neighbor had set off a shell measuring several megatons that barely cleared the treetops. 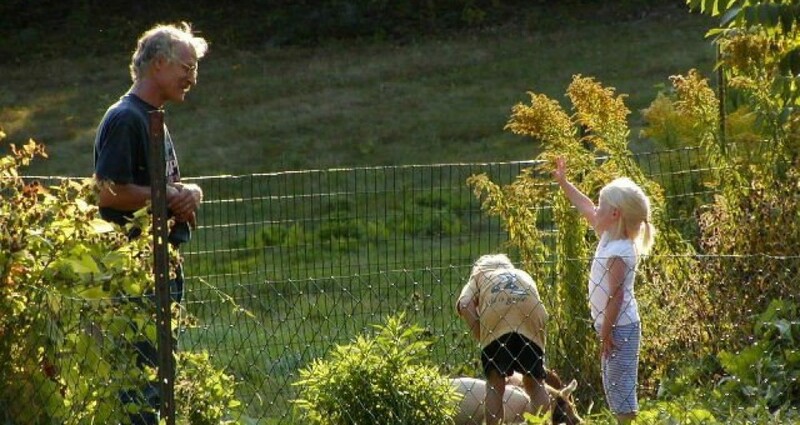 The goats had totally freaked out, and behaved like cartoon characters who leave a hole of their size and shape, running through a wall, only the goats ran through a fence. I caught up to my son halfway to Greenville, and he told me he’d managed to herd the goats half the way back when the neighbor set of an even bigger display. He hadn’t yet caught up to the goats a second time, but we figured they must have veered away from Greenville, because an even bigger and more raucous display was going off in that direction, and they now likely were heading for the town of Temple. I wondered about a lot of things, as the mad full moon rose orange midst the fireworks flashes of the night. I wondered over the fact that only twenty years ago I would have been walking in woods, but now was in a transplanted Waltham, a hundred new houses. I wondered over the odds of my being arrested for wandering through people’s backyards yelling, “Here Goats! Here Goats!” I wondered why people moved to the country when they lacked the courtesy to avoid terrifying livestock. I wondered if this was God’s way of declaring my independence from goats, from farming, and of freeing my time for poetry. I wondered if the local bear would relish a good goat dinner. I gave up when the fireworks were quieting only a little, at 10:30, (when they legally are suppose to stop). I recalled I was “deacon-on-duty” at church, in the morning, and it would not be proper to show up red-eyed and incoherent. Also the goats had headed into a swamp full of thirsty mosquitoes, and I have only so much blood. Enough was enough, and I went back to bed. I was back at the barn in the twilight of dawn, yawning but dutifully ready to hunt down the goats, but the goats beat me back, and were waiting for me. They were not cut very much from their wild, panicky run through darkness, but very hungry, and as the day progressed they seemed to get sore and to limp a little, though not as much as I did. When I got back from tending to the goats, still before sunrise and church, my wife showed me a couple Facebook exchanges she thought might interest me. The first involved people who had moved to the country to have horses, who were irate about how the fireworks had freaked out their horses, and who were rebutted by many, many Facebook pundits who said if they didn’t like freedom and fireworks they should move back to the city, and take their snobby horses with them. The second exchange involved a photo of a black bear walking by the entrance to our church, close to the sign that says “All are welcome.” I said we should add, “except bears”. I find it odd that, even as people destroy the country by wanting to move out into it, they live such an indoorsy lives, tweeting and facebooking, that the wildlife is moving back into the suburbs. Even down near Boston deer, moose, coyote, beaver, ermine, fisher-cats, wildcat and black bear, (practically extinct in my boyhood), are now chowing down at backyard bird-feeders. Now I have become an anachronism, an old Yankee who really doesn’t fit in. Strangely, despite my being a misfit, we have a long waiting list at our Farm-childcare. I suppose we are what the TV calls “green”, and are therefore desirable, though I am a conservationist and heartily despise all that environmentalists claim is “green” and “natural”. 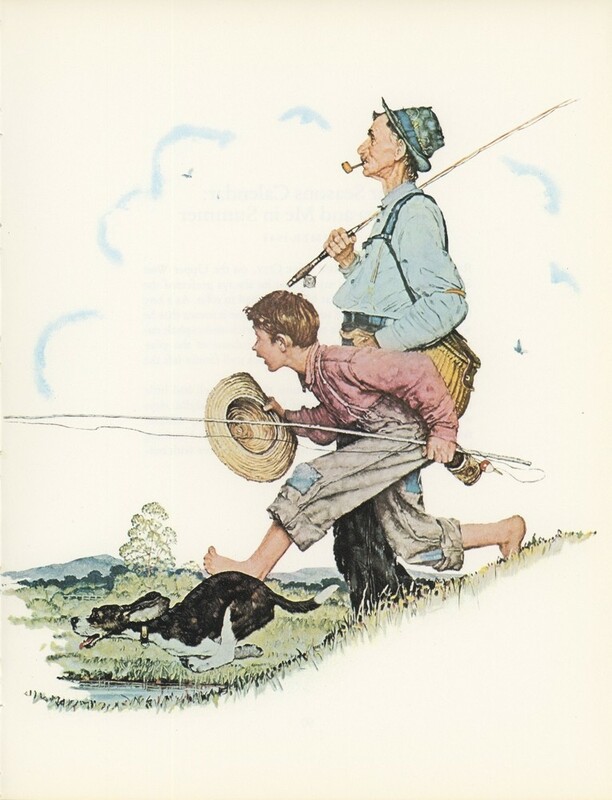 It is difficult to describe the difference between a conservationist and an environmentalist, but I think Norman Rockwell could paint a picture of what conservationists represent. But try to imagine, if you can, a Saturday Evening Post cover portraying what environmentalists represent, in a manner that would make you smile and glad to be a member of the human race. I doubt you can. At best you would have a Pravda characterization of humanity, a propaganda poster, white-teethed and bronze-skinned Kens and Barbies marching on to the dictator’s utopia. Compare such unreal faces to the Rockwell faces in this post, and tell me which are closer to nature. In the face of surging, giggling joy. The dark dreads of night, joy drives gloom away. Have light in their eye, and life’s their cookie.